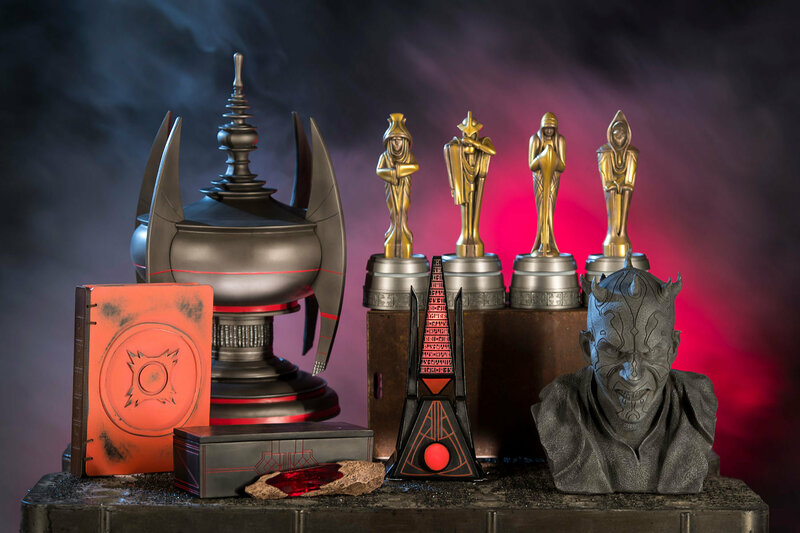 Dok-Ondars Den of Antiquities in StarWars Galaxy’s Edge will feature rare items from across the galaxy for sale, all part of Dok-Ondar’s collection. 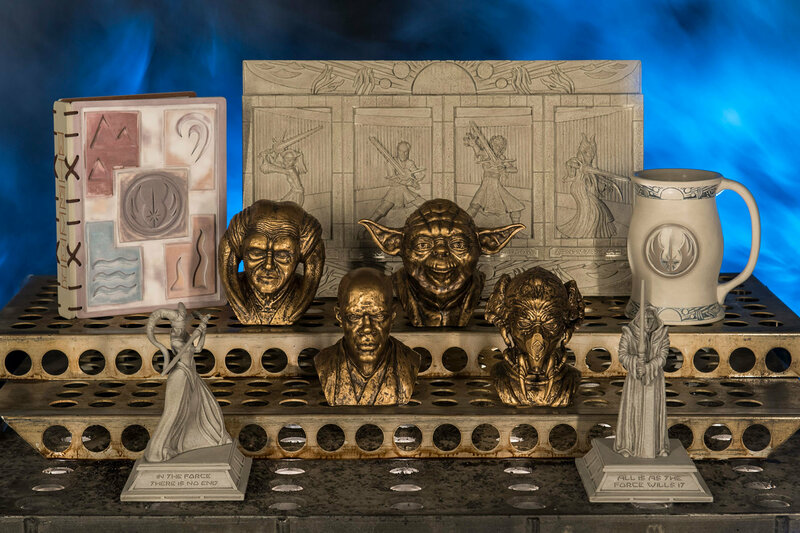 Items will represent different eras of the Star Wars galaxy, including holocrons, ancient Jedi and Sith artifacts, lightsabers and more. 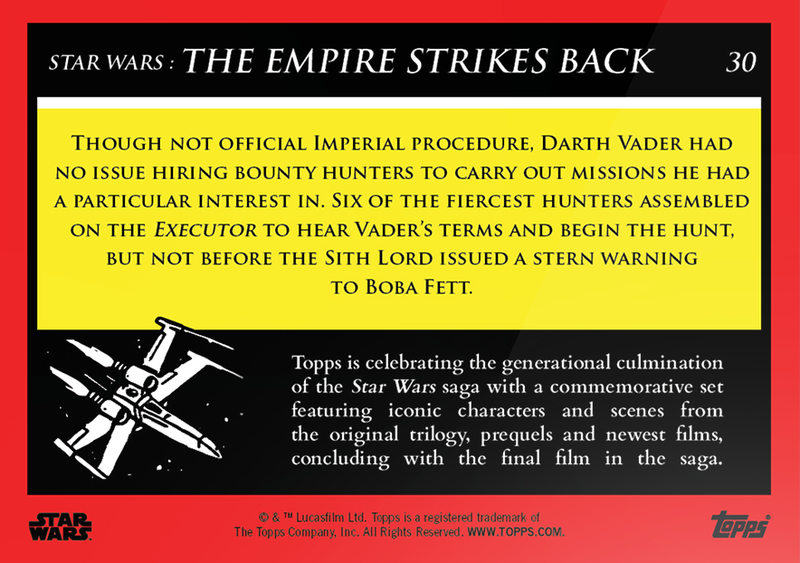 record their teachings for future generations seeking to understand the mysteries of the Force. 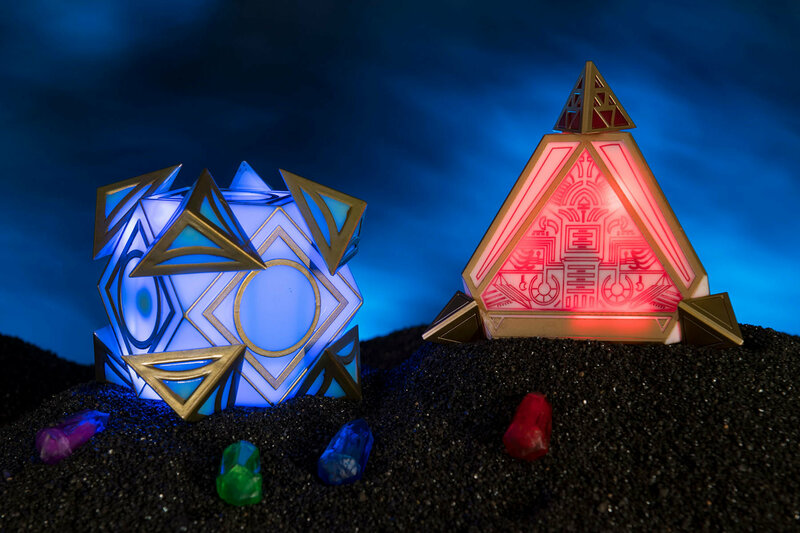 Kyber crystals can unlock additional content in both the Jedi and Sith Holocrons. 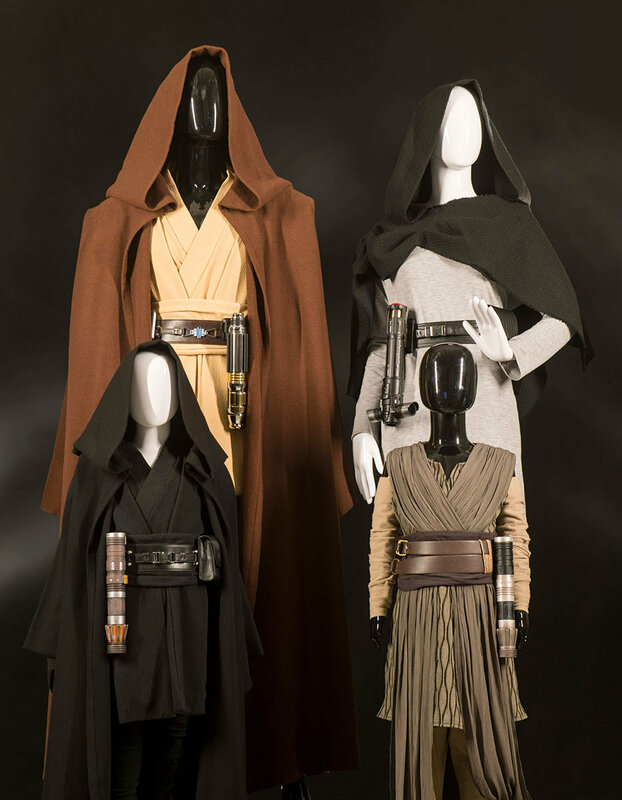 At Savi’s Lightsabre Workshop, guests will have the opportunity to customise and craft their own lightsabers. 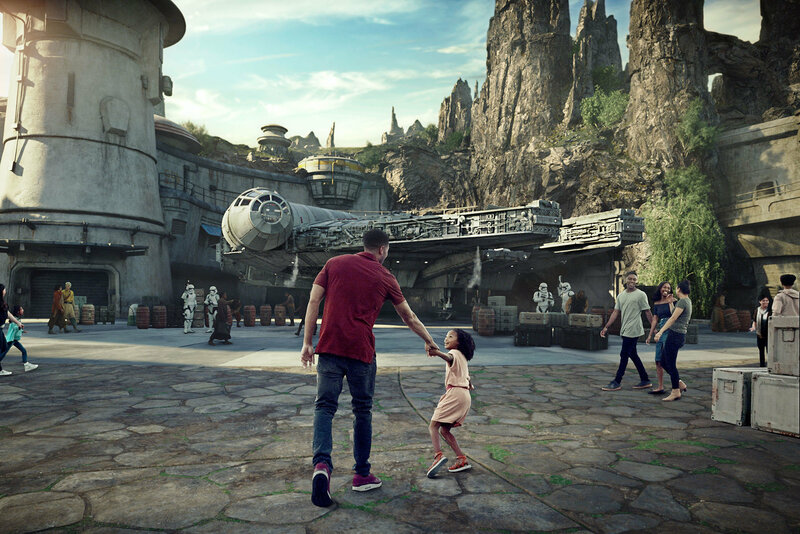 In this exclusive experience, guests will feel like a Jedi as they build these elegant weapons from a more civilised age. 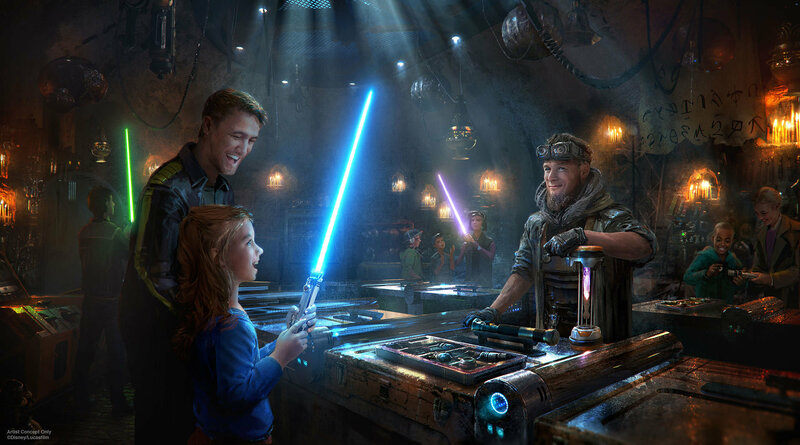 At Savi’s Workshop, guests will be able to build their own lightsaber, guided by ancient wisdom but crafted by the choices they make on their own adventure. 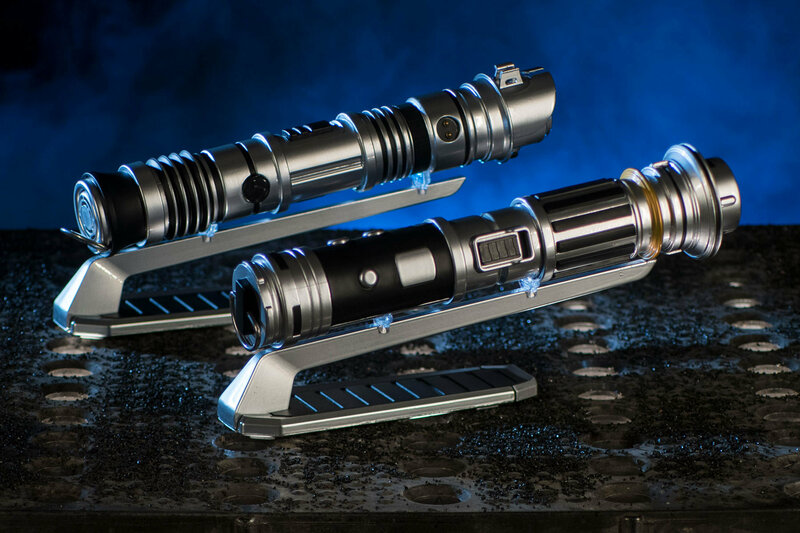 Each build will begin with a personal connection to a kyber crystal used to ignite the custom lightsaber. 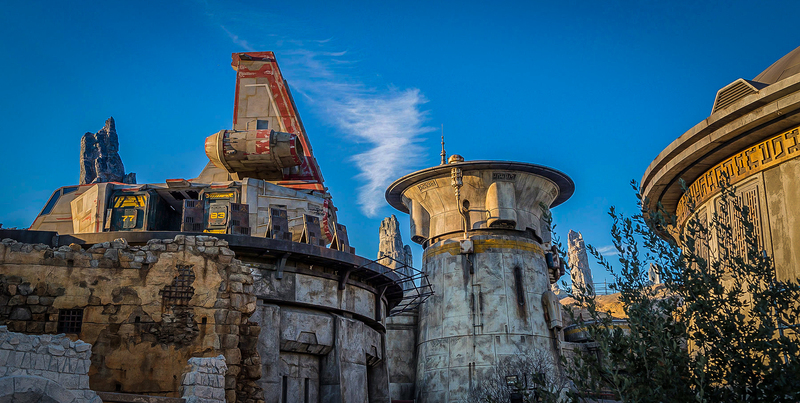 Exotic finds can be found throughout Star Wars: Galaxy’s Edge. 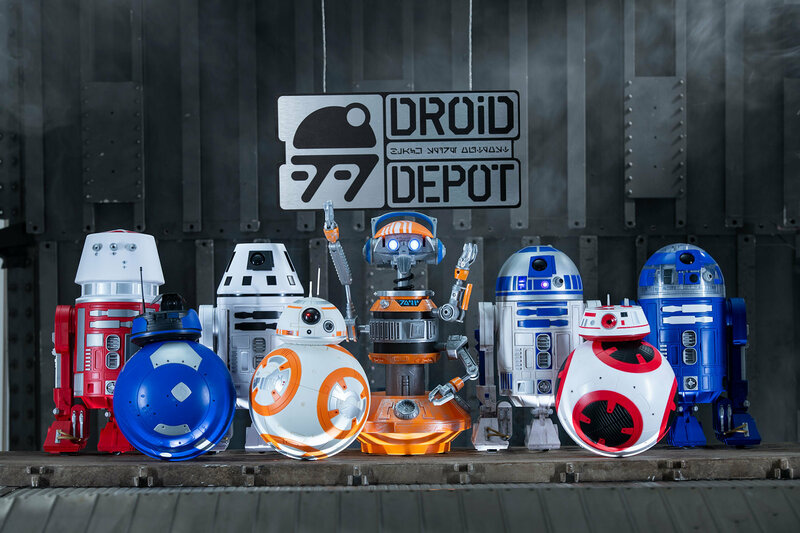 In the Droid Depot, guests will be able to build their own personal droids. 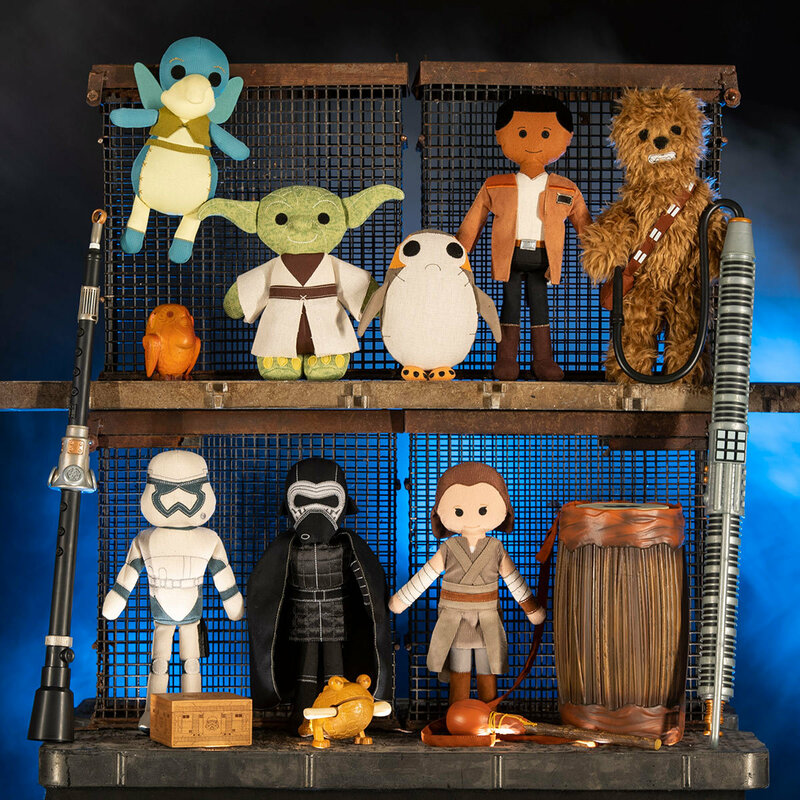 Wars: Galaxy’s Edge will feature an assortment of artisan-style plush characters, wood and tin toys and musical instruments. 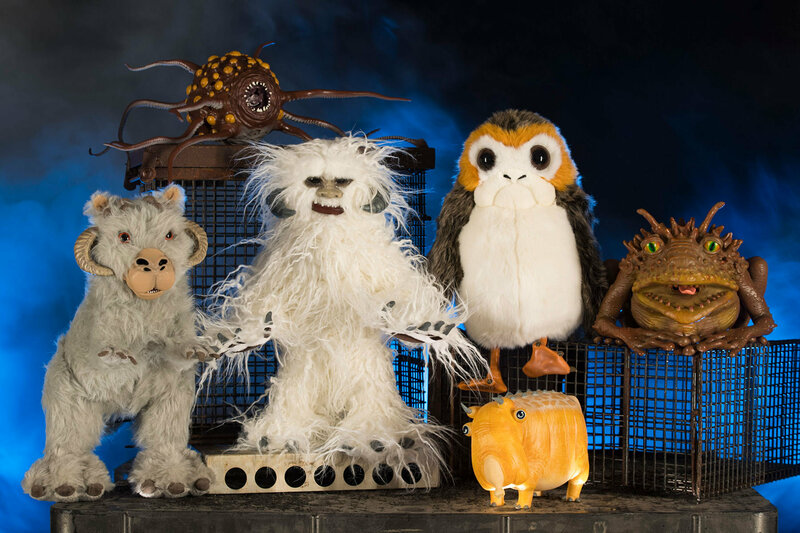 Bina’s Creature Stall in Star Wars: Galaxy’s Edge will offer creatures of the galaxy, including porgs, tauntauns and more. 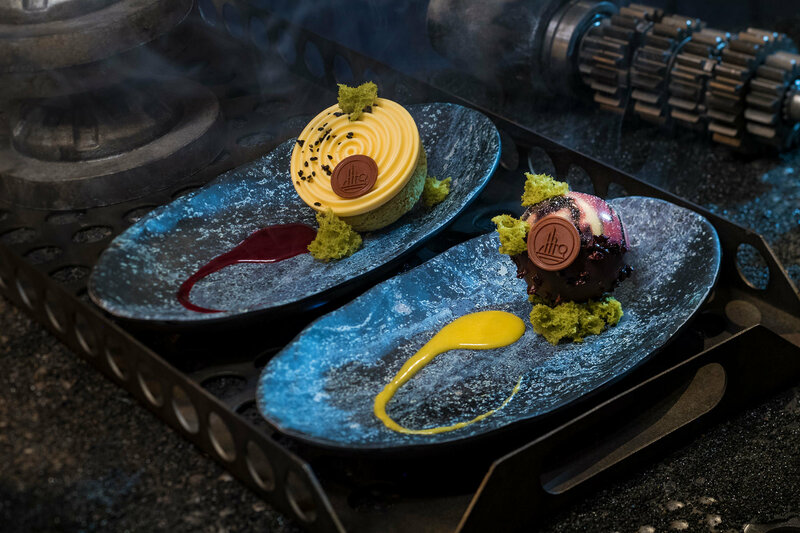 If the rides and experience isn’t enough for you, or even the cocktails at Oga’s Cantina at Star Wars: Galaxy’s Edge local watering hole, well the innovative and creative eats from around the galaxy that will be available at Star Wars: Galaxy’s Edge will fulfil your inner needs. 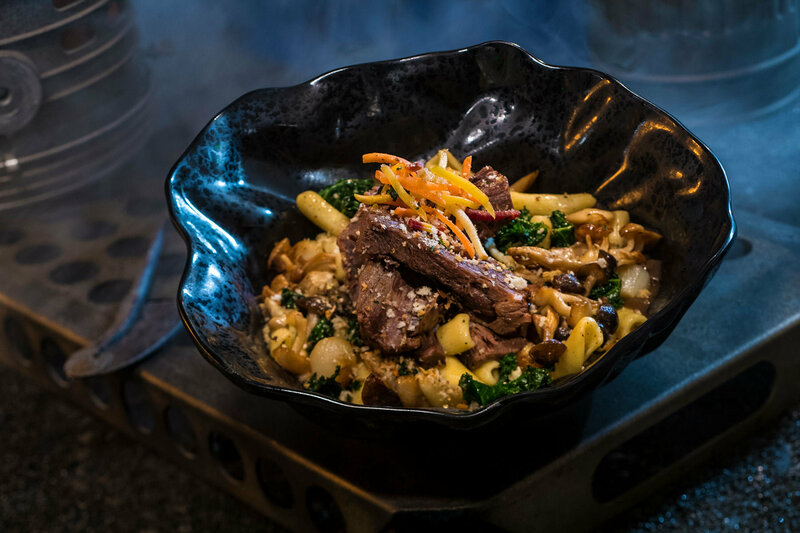 The Braised Shaak Roast, found at Docking Bay 7, features beef pot roast with cavatelli pasta, kale and mushrooms. 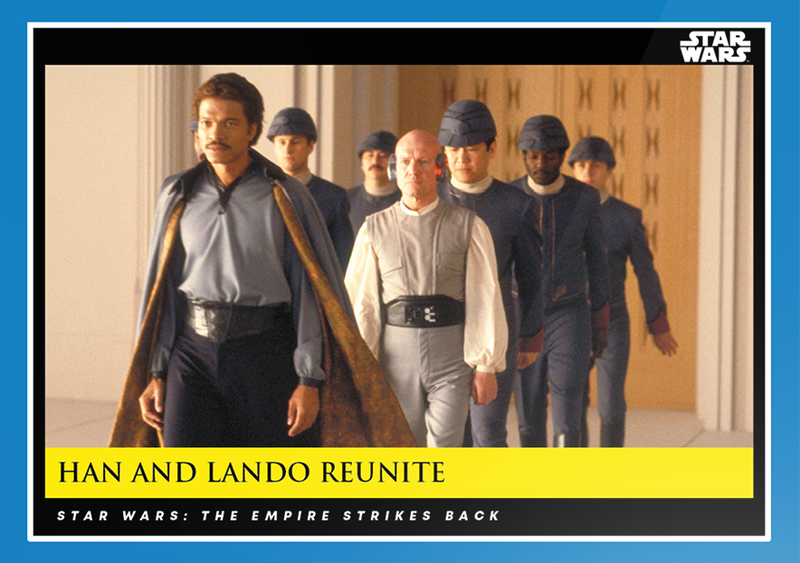 In a galaxy far far away, Shaak is a rotund, beachball shaped herd animal found on the plains of Naboo in The Phantom Menace. 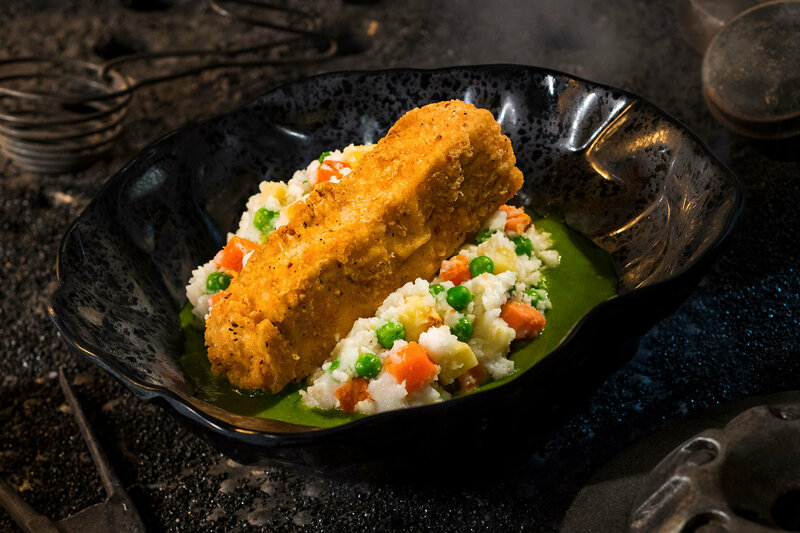 The Fried Endorian Tip-Yip is a decadent chicken dish with roasted vegetable mash and herb gravy, but in the Star Wars Universe Tip-yip are the flightless birds found among the Ewoks on the green moon of Endor. 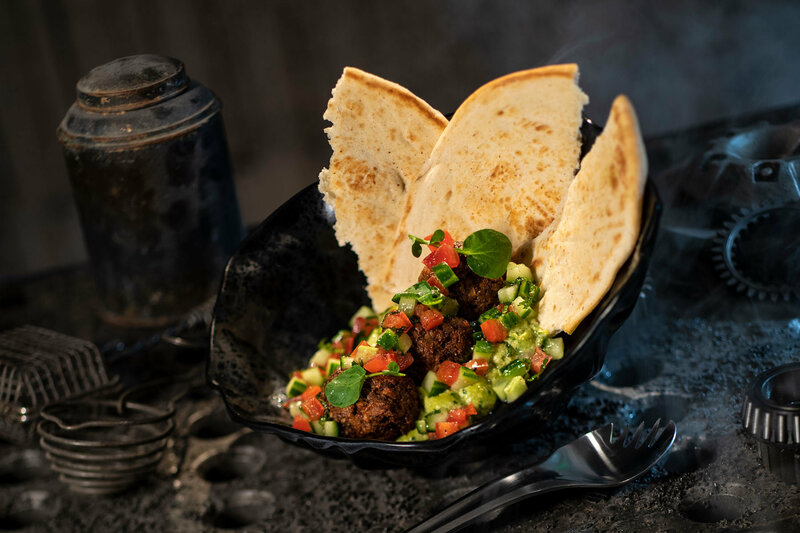 The Felucian Garden Spread is a plant-based kefta “meatball” dish with herb hummus and tomato-cucumber relish with pita bread for vegetarians. 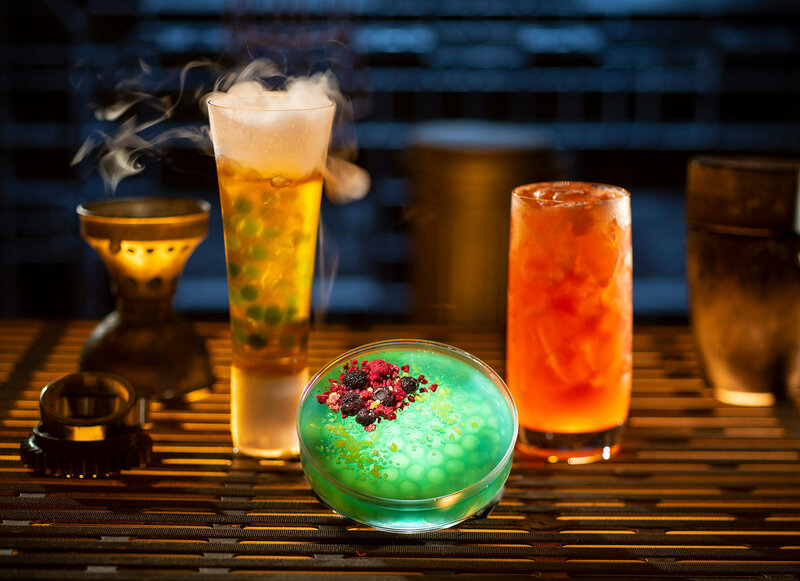 Yet in the Star Wars Universe, ‘Still meatless’ this is a protein from the world Felucia, known for its its vast array of colourful plant life. 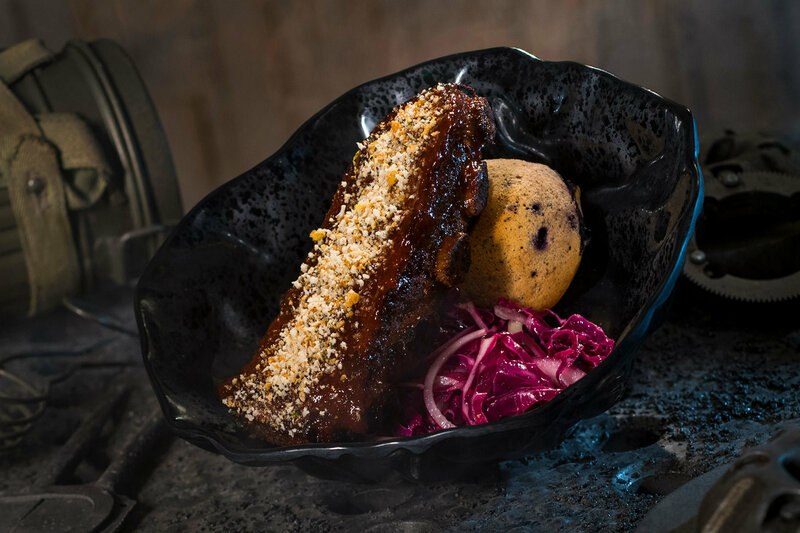 The Smoked Kaadu Ribs features smoked country sticky pork ribs with blueberry corn muffin and cabbage slaw. 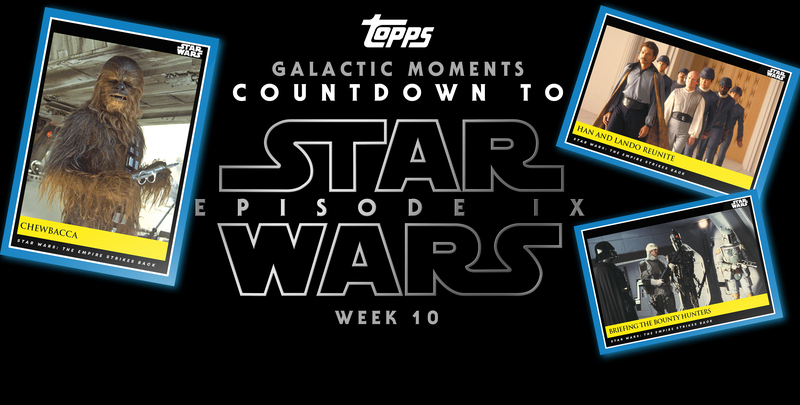 But in the Star Wars galaxy: A kaadu is the featherless-ostrich looking creature the Gungans ride into battle in The Phantom Menace. 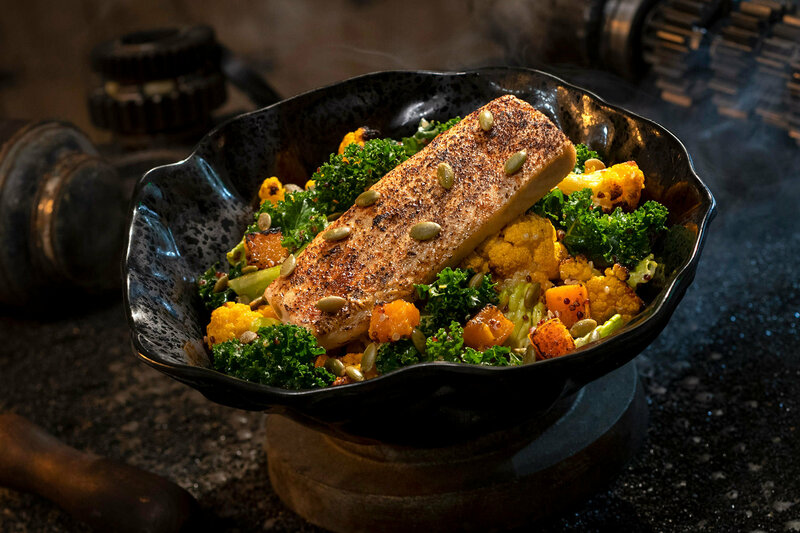 The Oven-roasted Burra Fish, found at Docking Bay 7 Food and Cargo, features Dijon-crusted sustainable fish with mixed greens, roasted vegetables, quinoa and pumpkin seeds with a creamy green curry ranch dressing. In the SW galaxy: Burra fish are sea creatures from the world of Dathomir, the home planet of Darth Maul. 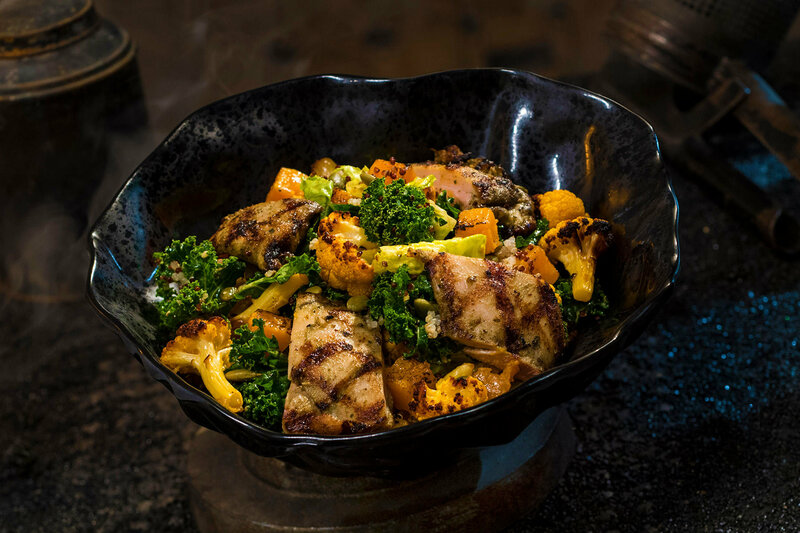 The Oven-roasted Tip Yip features roasted chicken with mixed greens, roasted vegetables, quinoa and pumpkin seeds with a creamy green curry ranch dressing. 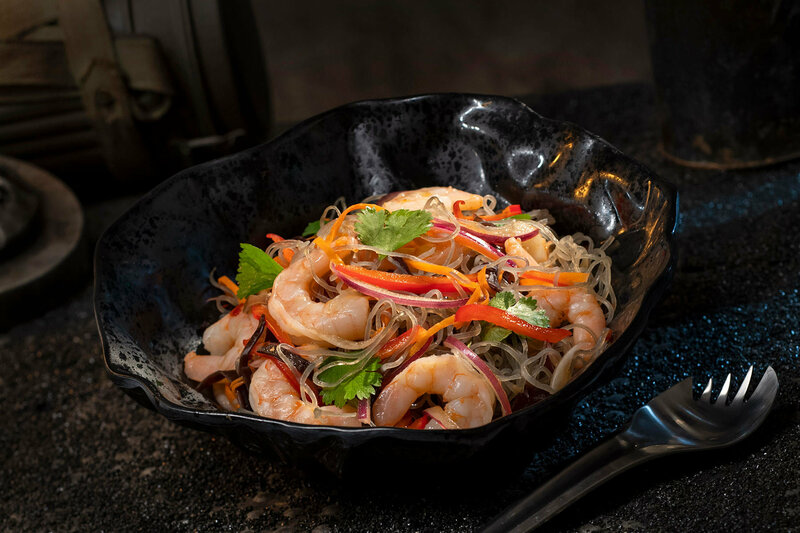 The Yobshrimp Noodle Salad which is a marinated arrowroot noodle salad with chilled shrimp. In the Star Wars Galaxy: This is yobshrimp, a crustacean native to Naboo, considered a delicacy by Gungans. 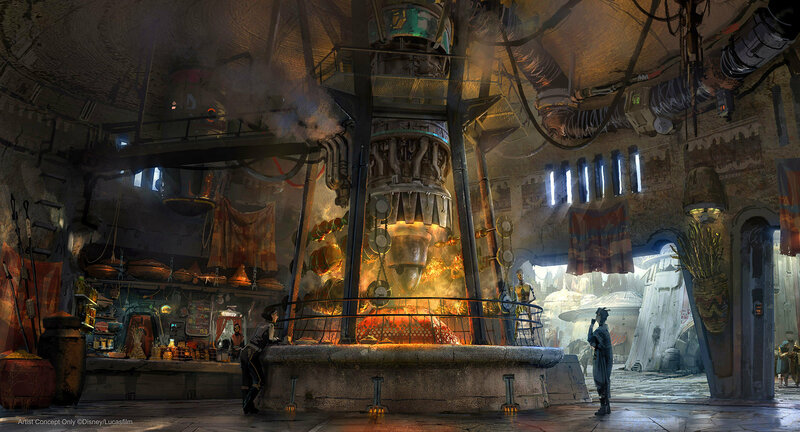 Docking Bay 7 is not the only place for Exotic Galactic eateries, Ronto Roasters will be serving food from around the galaxy as well. 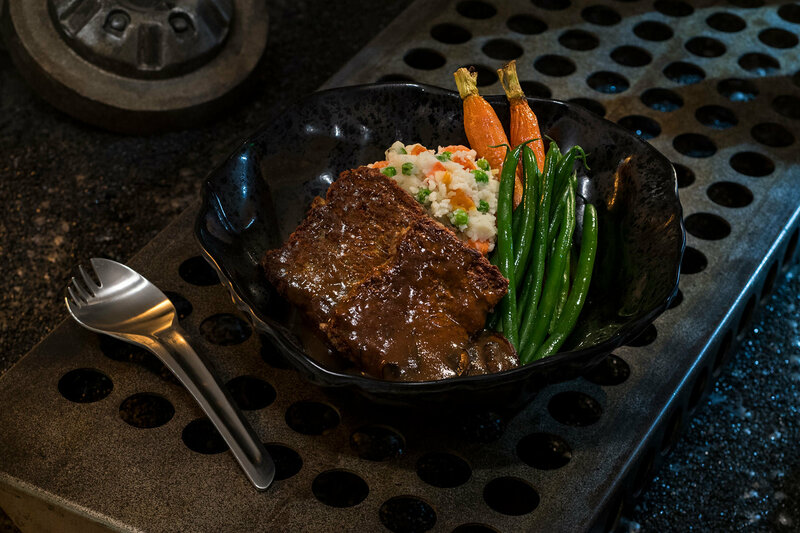 A recycled podracing engine fires up a spit of exotic meats, meticulously turned by a former smelter droid, 8D-J8. Guests can even sample some of the tasty Ronto fare. 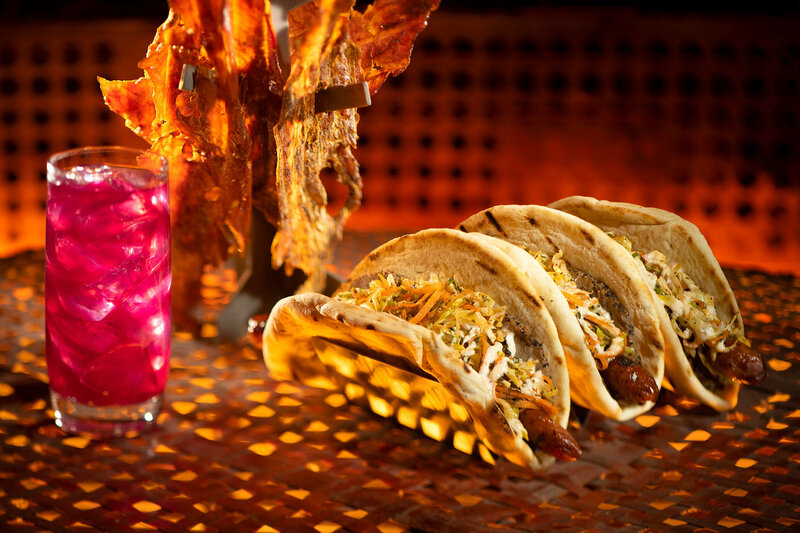 Barbecue pork with grilled sausage, coleslaw, and peppercorn sauce, found at Ronto Roasters, located in the Black Spire Outpost market. 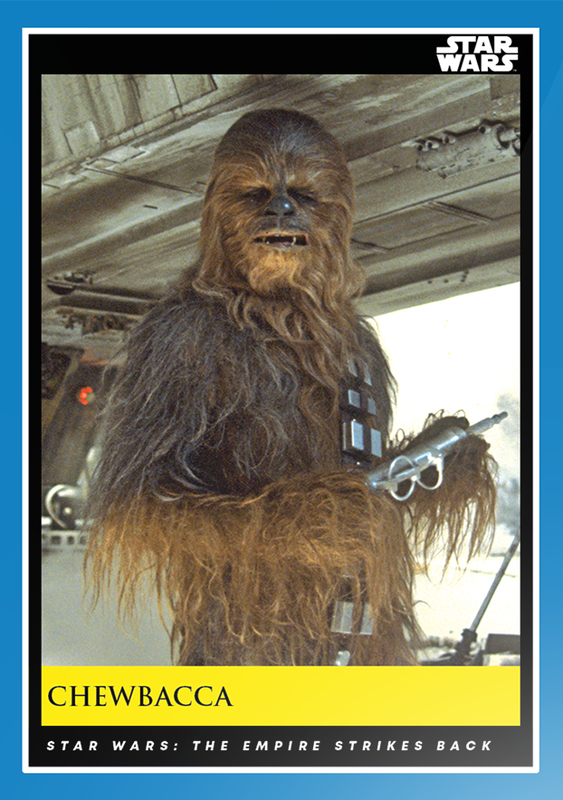 In the Star Wars galaxy, a ronto is the giant, dinosaur-like domesticated beast that Jawas ride through Mos Eisley on Tattooine. 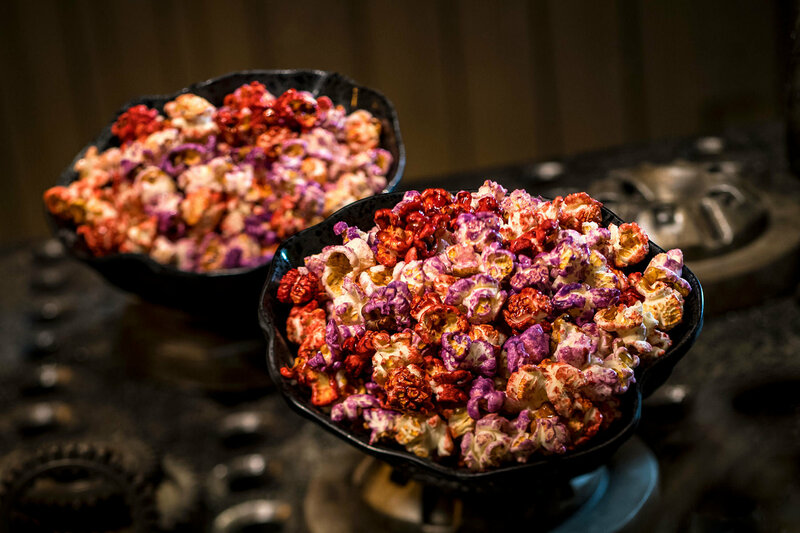 One of the many street market stalls, this grain vendor sells the ever-popular Outpost Mix (sweet and salty popcorn snack with a hint of spice). 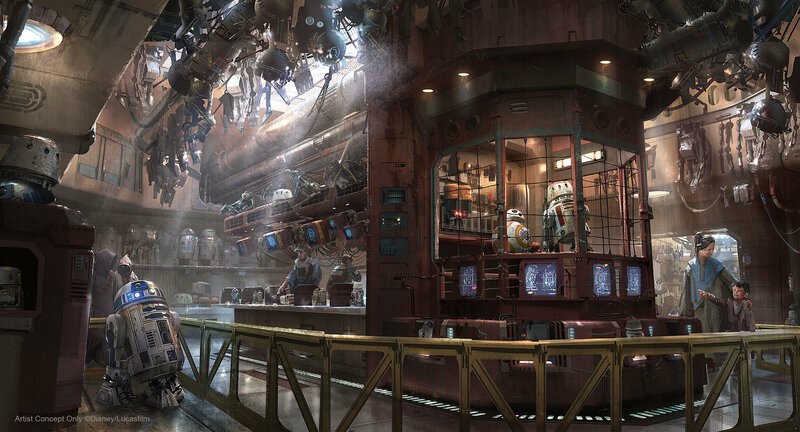 Oga’s Cantina at Star Wars: Galaxy’s Edge is a local watering hole to unwind, conduct business and maybe even encounter a friend … or a foe. 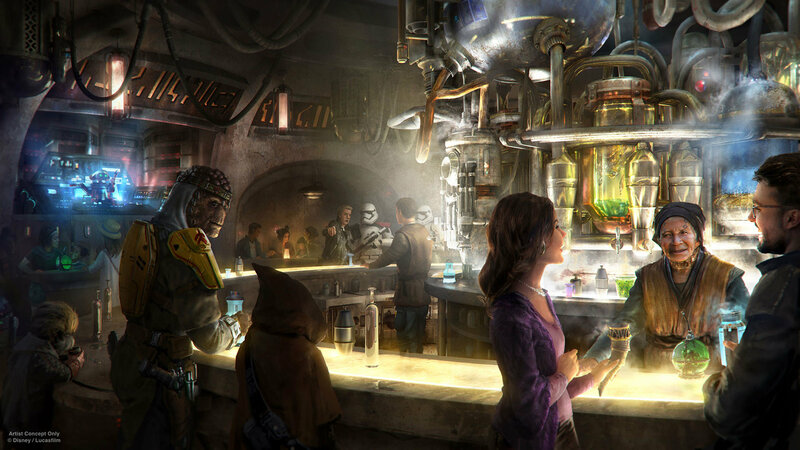 Patrons of the cantina come from across the galaxy to sample the famous concoctions created with exotic ingredients using “otherworldly” methods, served in unique vessels, with choices for kids and libations for adults. 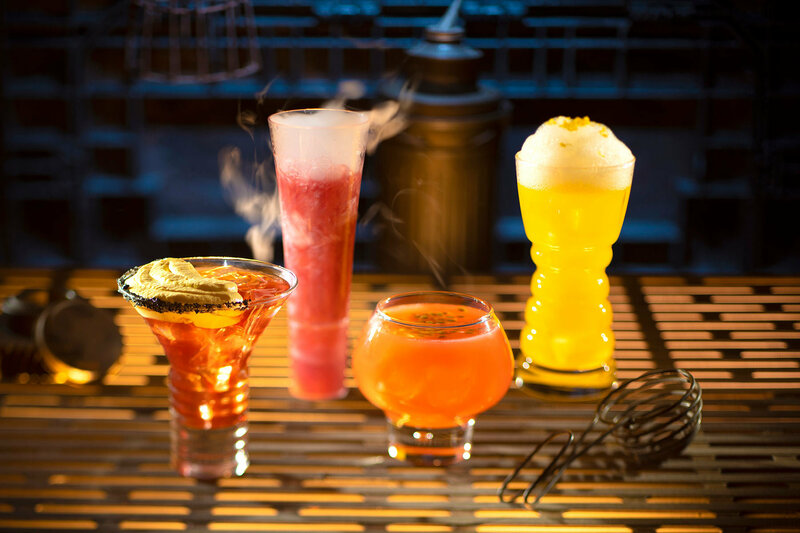 From left to right, non-alcoholic drinks: Carbon Freeze, Oga’s Obsession provision and Cliff Dweller can be found at Oga’s Cantina. 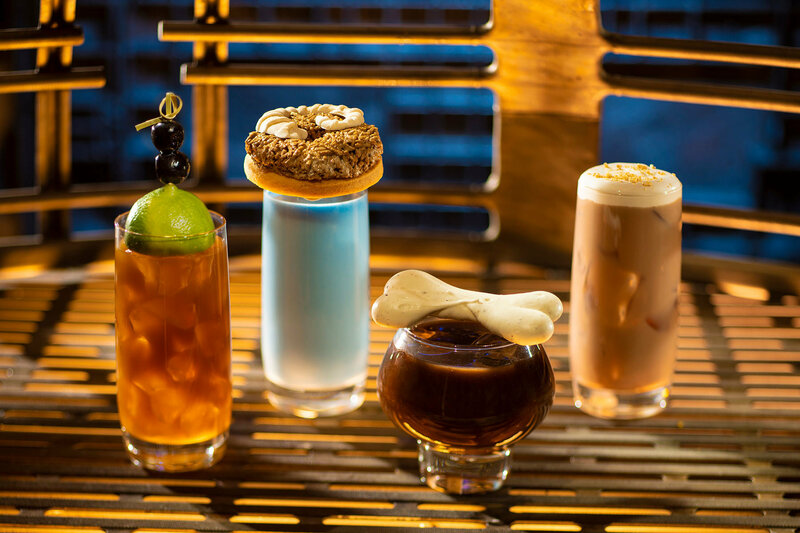 From left to right, alcoholic beverages: The Outer Rim, Bespin Fizz, Yub Nub, and Fuzzy Tauntaun can be found at Oga’s Cantina. 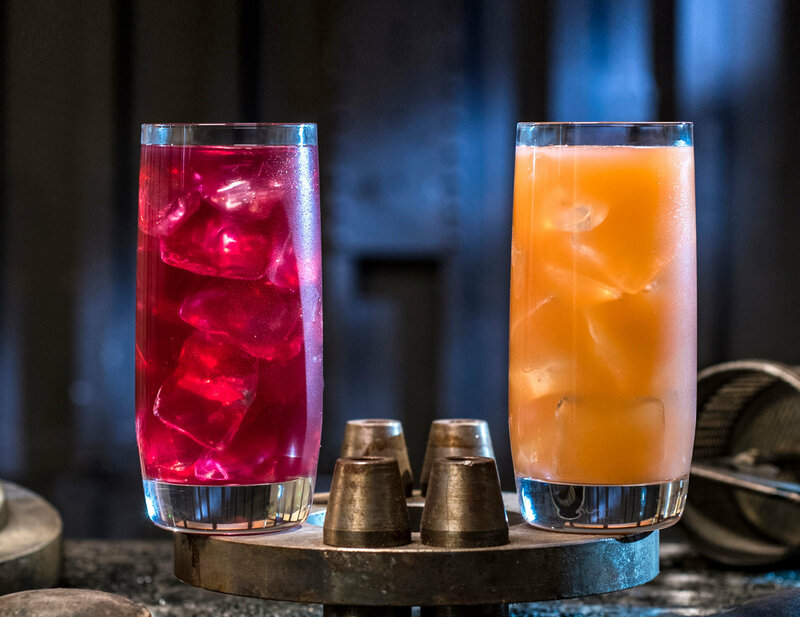 From left to right: Moogan Tea, Blue Bantha, Bloody Rancor (contains alcohol) and the Black Spire Brew can be found at Oga’s Cantina. 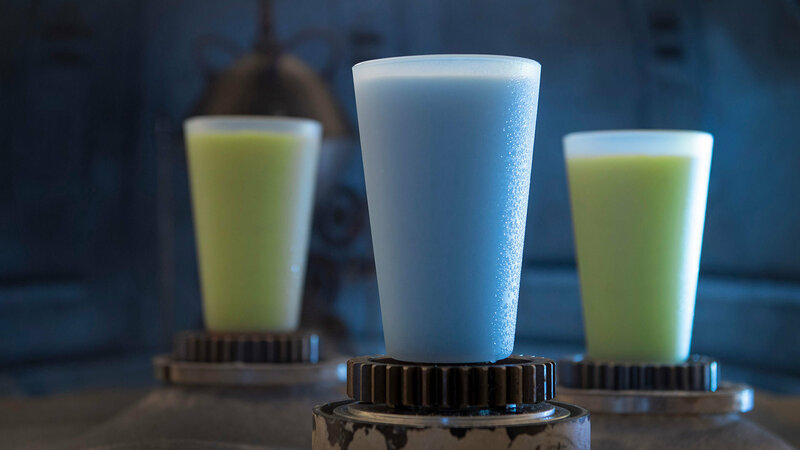 Innovative and creative drinks from around the galaxy will be available all over Star Wars: Galaxy’s Edge, the Phattro and Moof Juice can be found at Docking Bay 7 Food and Cargo. The Milk Stand – The place to go to get your farm-fresh blue milk or green milk, direct from Bubo Wamba Family Farms. 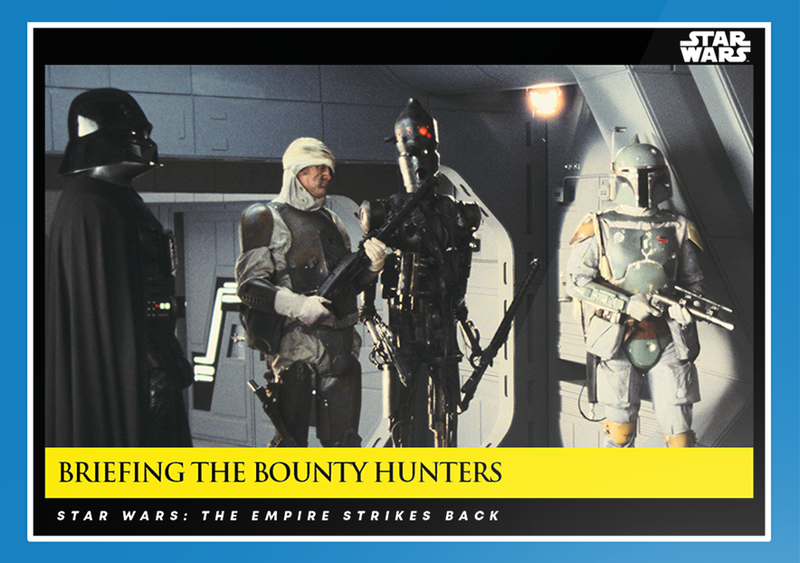 Ever since it first appeared in the original 1977 movie, moviegoers we’ve been wondering what Luke Skywalker’s favourite beverage would taste like.